I don't know if I dreamed up this idea or saw it on Pinterest. But wherever it came from, it's pure evil genius. I like to keep a can of Pillsbury cinnamon rolls in the fridge for a sometimes weekend treat. Cooking them in the waffle iron didn't make them taste any better necessarily, but it did make for a fun change of pace! 1. Spray waffle iron with nonstick spray and preheat to your desired temperature. 2. 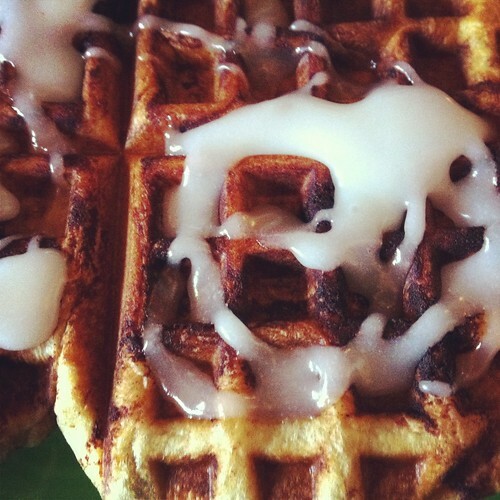 Place 2 cinnamon rolls at a time in the waffle iron and cook as if you were making a waffle. 3. Drizzle with frosting to serve.